Joseph Louis Gay-Lussac (December 6, 1778 – May 9, 1850) was a French chemist and physicist whose discovery of the law of combining volumes of gases in chemical reactions paved the way for our understanding of molecules and atoms. He also demonstrated that different gases expand at the same rate when subject to an increase in temperature at constant pressure. He was a co-discoverer of the element boron. His work demonstrated his talent for uncovering the principles that underlie outward phenomena, and it had a lasting effect on the history of chemistry and physics. Moreover, he was a great teacher who was much sought after. Gay-Lussac was born at Saint-Léonard-de-Noblat, in the department of Haute-Vienne. Of the three daughters and two sons of Antoine Gay-Lussac, he was the eldest male child. Gay-Lussac's father was an officer of the king, and his grandfather was a medical doctor. In 1789, at the beginning of the French Revolution, his parents found it necessary to keep Gay-Lussac at home, where he received his early education. But by 1795, the Reign of Terror having abated, he was sent to Paris to prepare for entry into the École Polytechnique. He remained at the Pension Savoure and a number of other boarding schools until he gained admittance to the Polytechnique in 1797. At the Polytechnique, he received a rigorous introduction to advanced mathematics, physics and chemistry. During his studies there, he attracted the attention of the famous chemist Claude-Louis Berthollet, who would remain a lifelong friend and mentor. After three years at the Poltytechnique, he entered the École Nationale des Ponts et Chaussées, and shortly afterwards became Berthollet's demonstrator and assistant. Berthollet took him to his private laboratory in Arcueil, where he came into contact with the physicist-mathematician Pierre-Simon Laplace. These two scientists exerted a profound influence on his career. In 1802, he was appointed demonstrator to A. F. Fourcroy at the École Polytechnique. In the same year, he published an important paper relating to the properties of gases. Gay-Lussac found that the rate at which all gases expand with increasing temperature is the same. This was a significant discovery, as it paved the way for the concept of absolute zero, the temperature at which the volumes of all gases are reduced to zero. Also around this time he embarked on an ambitious series of experiments involving phenomena as diverse as the behavior of fluids and vapors, and the improvement of thermometers and barometers. 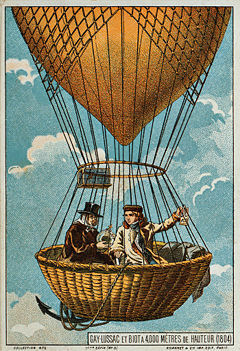 Gay-Lussac and fellow scientist Jean-Baptiste Biot were commissioned by the French government, at the instigation of Berthollet and Laplace, to make an ascent in a hot air balloon to take measurements of the earth's magnetic field and perform other experiments. They found that the properties of the magnetic field retained undiminished at elevations as high as four thousand meters. They also measured the air pressure and the temperature during their ascent. In order to take readings at even greater heights, Gay-Lussac made another ascent, this time alone, and was able to achieve an elevation of seven thousand meters, a record for that time. During this ascent, Gay-Lussac was able to bring back samples of air, and found their composition to be the same as the air at the earth's surface. In 1805, Gay-Lussac accompanied Alexander von Humboldt on a year-long tour of Europe, during which he met many of the famous scientists of his day, including Alessandro Volta. During this trip he took measurements of the earth's magnetic field, and studied Mount Vesuvius, an active volcano which erupted around that time. In 1807, a year after Gay-Lussac's return to France, Berthollet established a society of scientists called the Societe d'Aucuiel. Gay-Lussac was included in its membership. Among the memoires published by the society included Gay-Lussac's magnetic measurements made during his European tour, as well as work that he is perhaps best remembered for, in which he formulated what is today generally referred to Gay-Lussac's law of combining volumes. Joseph Priestley had observed that a volume of oxygen combines with a double volume of hydrogen to produce water. Gay-Lussac extended his observations to other gases, and noted that, when combining with one another, they always do so by volume in simple integral ratios. For example, he found that hydrogen and chlorine combine in equal volumes, while one volume of nitrogen and three volumes of hydrogen produce two volumes of ammonia. This law helped in a more complete understanding of a similar law announced by John Dalton, called the law of multiple proportions, which governed the combining weights of an element that formed more than one compound with another element. On the basis of Dalton's and Gay-Lussac's work, Amedeo Avogadro proposed the hypothesis that equal volumes of gas contain equal volumes of molecules, one of the cornerstones of modern chemistry. 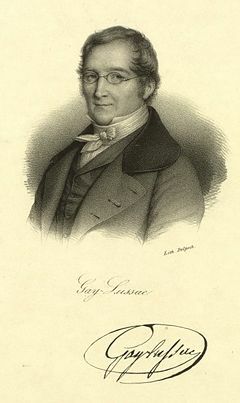 From 1808 Gay-Lussac was appointed professor of physics at the Sorbonne, and in 1809 he also became professor of chemistry at the Polytechnique. In 1809 Gay-Lussac married Geneviève-Marie-Joseph Rojot. He had met her first when she worked as a linen draper's shop assistant and was studying a chemistry textbook under the counter. He then provided for her education. His relationship with his wife is said to have been very close and mutually supportive. The couple were parents to five children, of whom the eldest (Jules) became assistant to Justus Liebig in Giessen. In 1815, Gay-Lussac carried out some important research on iodine and its compounds, although British scientist Humphrey Davy is generally credited with having identified iodine as an element. The name Gay-Lussac gave the element, iode, and its English derivative, iodine, was the one that came into general use. In 1824, Gay-Lussac played host to the young Liebig, who remained at Gay-Lussac's laboratory for about six weeks investigating prussic acid. This somewhat quenched the intellectual thirst of the young chemist, who found it hard to find a place where he could receive instruction in chemical analysis. Liebig went on to establish a laboratory where he educated an entire generation of chemists, based on what he had learned in Gay-Lussac's laboratory. Gay-Lussac often allowed young scientists to work in his laboratory, and in this way trained many of the famous names that succeeded him in his researches. In 1832 Gay-Lussac resigned from the Sorbonne and accepted the chair of chemistry at the Jardin des Plantes. In 1831 he was elected to represent Haute-Vienne in the chamber of deputies, and in 1839 he entered the chamber of peers. While he generally enjoyed robust health throughout his life, in his last six months his physical condition deteriorated. He died May 9, 1850, at the age of 72, at his residence at the Jardin des Plantes, Paris. The experiments which I have described, and which have been made with great care, prove incontestably that oxygen, hydrogen, azotic (nitrogen), nitrous acid, ammoniacal, muriatic acid, sulfurous acid, carbonic acid, gases, expand equally by equal increments of heat...therefore, the result does not depend on the physical properties, and I collect that all gases expand equally by heat. The law is often attributed to Jacques Charles because Gay-Lussac mentioned some experiments Charles had done demonstrating the law in particular cases. However, Gay-Lussac announced it as a general law, and provided more exacting experimental data to bolster his conclusion, than either Charles or Dalton. The proper dependence of the expansion coefficient on the temperature itself was also expressed correctly by Gay-Lussac, a result that Dalton's more crude experiments failed to detect. Charles believed the law did not subsist for water-soluble gases, but Gay-Lussac demonstrated that it could be extended to those cases as well. Gay-Lussac's results were expressed as the expansion of gases for a temperature difference equal to that of the freezing and boiling points of water. In 1805, together with his friend and scientific collaborator Alexander von Humboldt, and based on the samples of the atmosphere he had taken during a balloon ascent, he discovered that the basic composition of the atmosphere does not change with increasing altitude. In 1808, Gay-Lussac and Louis-Jacques Thenard succeeded in isolating what they called the radical of boric acid, not yet aware that it was an element. They accomplished this by heating boric acid with potassium metal, the insoluble portion of the reactants being the radical. They continued their research through the summer, purifying the element by heating its oxide with potassium. They did not announce that they had discovered an element until November, but that was still a month before Davy also claimed to have isolated it. In the same year, they mentioned the possibility of the elemental character of chlorine, but it was left to Davy to announce that conclusion with more definiteness the succeeding year. In 1815, the rivalry that had been generated between Gay-Lussac and Davy over the discovery of elements once again surfaced in a quest to determine the nature of what would become known as iodine. Gay-Lussac published his conclusions in a newspaper article, a day before Davy communicated a similar finding to the Royal Society of London. The colorful story of Davy's trip to Europe at the time, and his examination of samples of iodine using a portable laboratory, bolsters his claim to discovery in popular literature, although Gay-Lussac appears to have announced his results first. Gay-Lussac discovered two very important empirical laws that later found their explanation in the atomic theory of matter. These discoveries demonstrated his powers of generalization, and his talent for uncovering underlying principles behind phenomena. Generations of chemists and physicists had their start through internships in Gay-Lussac's laboratory. There can be little doubt that he was a great and much sought after teacher. It cannot but be admitted however, that Berthollet's mentorship had much to do with Gay-Lussac's successful career. Gay-Lussac's name will be forever remembered, not just for the laws named for him, but for their actual effect upon the history of chemistry and physics. Perhaps he owes much of his success to a book he read, The Beauties of History, or Pictures of Virtue and Vice, Drawn from Real Life; Designed for the Instruction and Enlightenment of Youth. This helped him keep his moral compass, as undoubtedly did his wife after his marriage. These stabilizing influences allowed his imagination free reign while his conduct remained under the moral suasion of positive influences. In Paris, a street and a hotel near the Sorbonne are named after him as are a square and a street in his birthplace, St. Leonard de Noblat. His grave is at the famous cemetery Père Lachaise in Paris. Whewell, William. 1859. History of the Inductive Sciences. London: John W. Parker. Tilden, William A. 1921. Famous Chemists, the Men and Their Work. New York: E.P. Dutton. Asimov, Isaac. 1982. Asimov's Biographical Encyclopedia of Science and Technology. New York: Doubleday. Gay-Lussac, L. J. and A. von Humboldt. 1805. “Expérience sur les moyens oediométriques et sur la proportion des principes constituents de l'atmosphère.” J. Phys. LX. History of "Joseph Louis Gay-Lussac"
This page was last modified on 2 April 2008, at 07:30.